At 6.35 ounces, this reel is the absolute lightest aluminum-frame baitcaster in its class! Unbelievably tough, precise, and easy to handle, the Abu Garcia Revo Premier Low Profile Baitcast Reel features a rugged 1-piece aluminum frame and side-plate, an aircraft-grade Infinity II spool for long, accurate casts, a six-bearing system with superior HPCR ball bearings for heavy loads and harsh environments, Linear Magnetic Brake, and the proven Carbon Matrix Drag System. "This is a nice reel. I wish they had a 5:4 in S . I don't really like the break systems in the other Revos." "I love this baitcaster. In fact, i love most everything from Abu Garcia :] Their quality in everything is out of this WORLD!! Recommend for everyone." "I have had this reel for about 2 years, and it still works like its new. I would recomend this reel to anybody that does not want to spend alot of money on a reel. 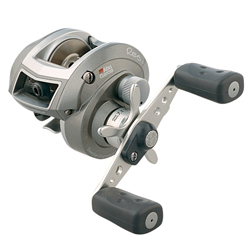 This reel is real smooth and has great power." "I've been an ardent fan of Shimano for the past 5 years or so. Most of my reels are Shimano and I own a bunch of Curados. Well I recently started fishing the Revo Toro and loved it. I started looking at switching out to the other Revos as well."